Normally, when I drive into New Orleans, my first order of business is to hit a restaurant and get something to eat, but on this particular Saturday, Darren Towns, my bass-drumming partner from the TBC Brass Band had told me that the band had a gig in the French Quarter at 5 PM, so I came straight off the Causeway and headed into the Treme neighborhood, because there’s always free parking available near the Treme Coffeehouse, and when the weather is fairly pleasant and warm, as this day was, the walk is not difficult and rather enjoyable. Unfortunately, I arrived at the museum where the parade was to start a little late, and the band and revelers had already left. I actually had already run into them as I was passing Jackson Square, but I didn’t recognize them because the tuba player was playing a green tuba, and I had never seen Bunny from the TBC with a green tuba. Finding everything dead around the Pharmacy Museum, I decided that the band I had seen must have been TBC after all, so following the distant sounds I heard, I caught back up with them on Royal Street. My eye caught Darren’s and he smiled, and tourists in the quarter were lining the street and filming. The occasion was actually just a private wedding, but quite a crowd was assembling all the same. We headed around the Supreme Court of Louisiana building and finally ended up at K Paul’s Restaurant, where the whole thing came to an end. It was a great way to start a weekend in New Orleans, and Bunny and Darren decided to meet me at Frankie and Johnny’s uptown for some seafood. As I was walking down Bourbon Street near the Four Points by Sheraton hotel, I finally came upon what I had been looking for all afternoon, a brass band, although it wasn’t one I had heard of, but rather a new band called the Legacy Brass Band. One of the signs that New Orleans’ brass band scene is healthy is the constant appearance of new brass bands in the city, and the relative youth of the members. The Legacy proved to be a good-sounding band with good arrangements, and the ability to attract a crowd. I was impressed with the slogan on the back of their shirts, “Music Is Not A Crime”, a reference to the city’s recent crackdowns on live music that have made brass band appearances rarer outside of night clubs or second-line parades. Far sadder was a handwritten eulogy on the bass drummer’s drumhead, in memory of someone named Big Whoop who presumably was killed, an all-too-often occurrence in New Orleans. The good news is that brass bands and the opportunity to become musicians are significant lures to young men and significant deterrents to crime and violence. With no second-line, I spent the afternoon browsing in the French Market, and walking around the French Quarter. I was vaguely hoping to run into a brass band somewhere, but the city government has been discouraging that of late. A band had been playing in Jackson Square, but they had taken a break and left their instruments piled up on a park bench while they relaxed on the steps of the Cabildo nearby. The other spot where brass bands used to be common was at the corner of Bourbon Street and Canal next to the Foot Locker, which had been a sort of proving ground for new young bands, but the city has fenced the whole area off, on the pretext that bricks have been falling from the nearby building, so bands can no longer play there. In reality, the city had suppressed the brass bands there before the area was fenced off. So I did some shopping at a couple of book stores, and then started walking back east toward where I had parked my car on elysian Fields. Almost anyone who has been to the French Quarter has seen Buffa’s Lounge. After all, it’s been there since 1939, and it’s on Esplanade, which is one of the major thoroughfares leading into the Vieux Carre. I had passed it any number of times over the years, but of course New Orleans is a city full of food choices, and so it just never occurred to me to try Buffa’s until I read somewhere a couple of years ago that they stayed open 24 hours a day and had a decent burger and decent breakfast. They also started booking live music a few years ago, and feature live traditional jazz at brunch on Sundays. So I decided that this was the year I would try Buffa’s, and I am glad I did. Parking was somewhat difficult, as it always is in the Faubourg Marigny, but the weather was beautiful and I didn’t mind walking a couple of blocks. The restaurant is in the back behind the bar, and there was literally only one table left when I walked in. Soon there was a small crowd waiting outside the door for tables, while a jazz band called Some Like It Hot was playing on stage. Breakfast was the reason I had come, and I had a delightful bacon, cheese and mushroom omelette with homemade biscuits and coffee. Omelettes are huge, taking up half the plate, and the only thing better than a breakfast in New Orleans is a breakfast in New Orleans with live jazz going on. Brunch at Buffa’s is an experience not to be missed. After 2 AM, parts of the French Quarter become calmer, more romantic and perhaps more mysterious. An odd note of music or distant laughter floats on the air. Bums are out and about, but so are lovers embracing, or tourists stumbling to their hotels, or locals walking home. Although night tours promote the idea of ghosts or voodoo, the French Quarter night seems anything but sinister. New Orleans hip-hop artist and activist Truth Universal may not be one of New Orleans’ most popular rap artists, but he is certainly one of the best. He appeared at the Recording Academy celebration in conjunction with cultural guardian and percussionist Luther Gray and with notable New Orleans DJ E.F. Cuttin. His amazing show opened with a libation ceremony for the ancestors, including poet Amiri Baraka who died recently. Robin Barnes is a relatively new neo-soul singer in New Orleans, backed by an excellent band known as the Soul Heirs. Her performance at the Recording Academy event on January 13 at the U.S. Mint was especially impressive, as was the musicianship of her band members. Immediately after Black Water Bride, Valcour Records’ artists Bonsoir Catin appeared. 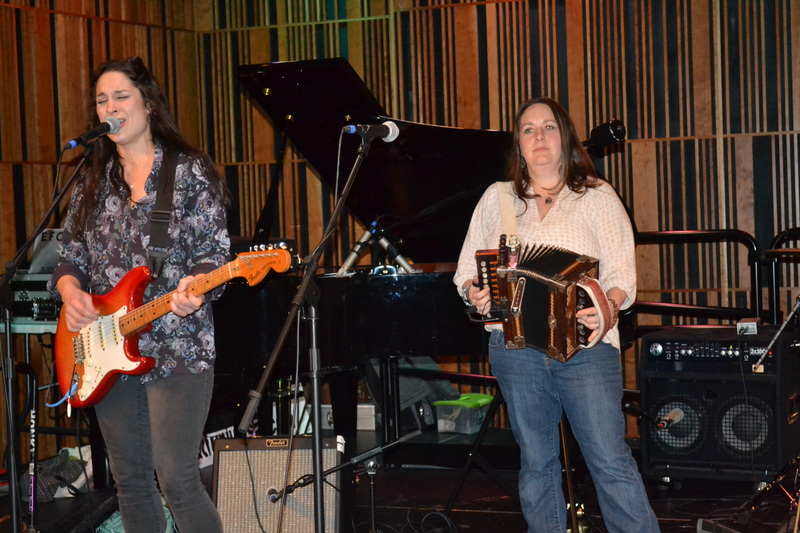 They are an all-female band playing traditional Acadian music from Lafayette, Louisiana, and like all Valcour artists, they are really good.